In this article, we explain the legal framework for the use of drones in Sweden. 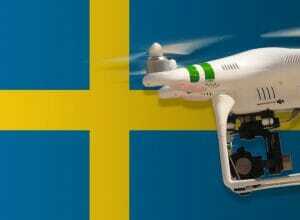 Since February 2018, new laws have been in force for the use of camera drones in Sweden. The rules have been greatly simplified, and you do not require as many permits as before. Drones are divided into several groups in Sweden. For drones under 7 kilograms (category 1), no permission is necessary anymore as long as you use your drone for recreational purposes. However, the copter must always be marked with the name and a telephone number of the operator. Maximum altitude: In Sweden, multicopters may only be operated below 120 meters above ground. Maximum horizontal distance and FPV: Your drone should only be operated within the direct line of sight. Compulsory insurance: For the private use of drones up to a take-off mass of 25 kg no liability insurance required. Nevertheless, the Swedish Aviation Authority recommends making drone insurance. Maximum take-off weight (MTOW): For a take-off weight below 7 kilograms, no further approval is necessary. Distance to airports: You may operate your drone only in a distance of 5 kilometers or more to an airport’s runway. This rule applies to airports with a control zone. To heliports, a distance of 1 kilometer must be considered. Other safety distances: A safety distance should always be chosen so that no other persons, animals or objects are disturbed or endangered. No-fly Zones: NFZs can be checked on this map. Also, it is forbidden to use a drone during rescue operations. Permits to fly: Conservation areas may require the consent of the nature conservation authority. Operating hours: Flights at night are permitted in Sweden if the drone is equipped with the lighting required for night flights. Special rules: If you want to publish your aerial footage (including YouTube or Facebook), you’ll need permission from the Lantmäteriet. This authority is responsible for protecting geographical data. To obtain approval, you must complete a form and then upload your recordings so the agency can review them. You can find more information about the process here. Requirements for commercial pilots: Commercial pilots no longer need a permit from the Transport Authority. This requires approval for the publication of aerial photographs. Good to know: If you want to fly within a control zone, then this is possible without special permission, as long as the drone does not fly faster than 90 km/h, flying not higher than 50 meters above the ground and a minimum distance of 5 kilometers to the runway of the airport comply. Around the military airports listed below, your drone is flying not higher than 10 meters: Karlsborg, Linköping / Malmen, Linköping / SAAB, Luleå / Kallax, Ronneby, Såtenäs, Uppsala, Vidsel, Visby, Hagschult, and Jokkmokk. We have researched the drone rules for Sweden listed here to the best of our knowledge. Unfortunately, we can not guarantee the accuracy of the information. If you want to play it safe, then contact the Swedish Aviation Authority. Alternatively, you can ask the Swedish Embassy in Germany for more information on the regulations. Please leave a comment when you hear news or have your own experiences with your copter in Sweden! you need to update regarding Sweden. There is now leagal to fly a drone with camera. New law take action from 1st of August 2017. There will be new rules from 1st of January 2018. You don’t need permission to start flying, but there will be regulations for which hight you flying on. Update Sweden: From august 1st 2017 drones with camera is no longer prohibited. The earlier camera law is no longer applicable. Thank you for your support. I updated the article. Hello, thanks for your article, I’m a tourist and a YouTuber from Italy, could you confirm that I can fly in line of sight with a DJI Mavic Pro in Stockholm? I’ve read the regulation with a translation from Sweden, it seems to be ok… could you please tell me something about it? What about comercial use of drone? I would like to record work on field of my company. Im from Poland. I had insurance which cover Europe and permissions for VLOS and BVLOS operations. Does someone have experience with drone video approval in Sweden? I sent a file to Lantmäteriet for approval. How long does it take to get a descision? I actually wait over 10 days. Is this normal? This is great information, thanks for compiling. Is the permission also needed for uploading on Instagram? I just got a DJI Tello, lightweight so I think I’m well within the rules of the drone weight and height of flying. Just wondering about uploading. Thanks! As far as I know, you don’t need permission for your Tello drone. I have recently purchased a DJI Mavic Air. So from what I read so far I don’t need to get a permission to fly, BUT there is a drone fly zone chart that I have been informed by a friend here https://daim.lfv.se/echarts/dronechart/. The thing is in the chart it says for example for Umea region, I cannot fly any drone in a 5 km radius distance to the runway which unfortunately covers all the old and interesting part of the city in Umea, but if I may read the Swedish description properly it says drones with less than 90 km speed and no more than 50 m height can fly in the control zone only. Does this mean that there is no chance to fly any drone in a 5 km radius from a runway at all or there are some exceptions that may apply? Would be great to know about your comments. Hey sir. Can i hand carry my DJI Phantom 3 proffesional? luleå to stockholm and stockholm to Peking?